@Night Huntress wrote: Just saw this on twitter- don't know the source but apparently Domnhall said that in an interview? He said it on the podcast, the same one where he was talking about Adam's Jesus joke. ah, thank you- the one I listened to had only the part with the joke in it- didn't know it was longer. 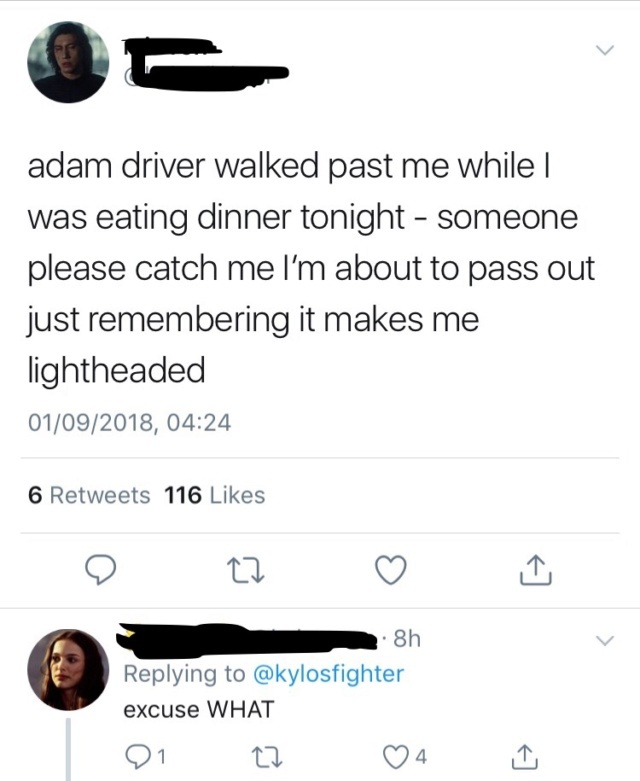 Adam was in New York last night! 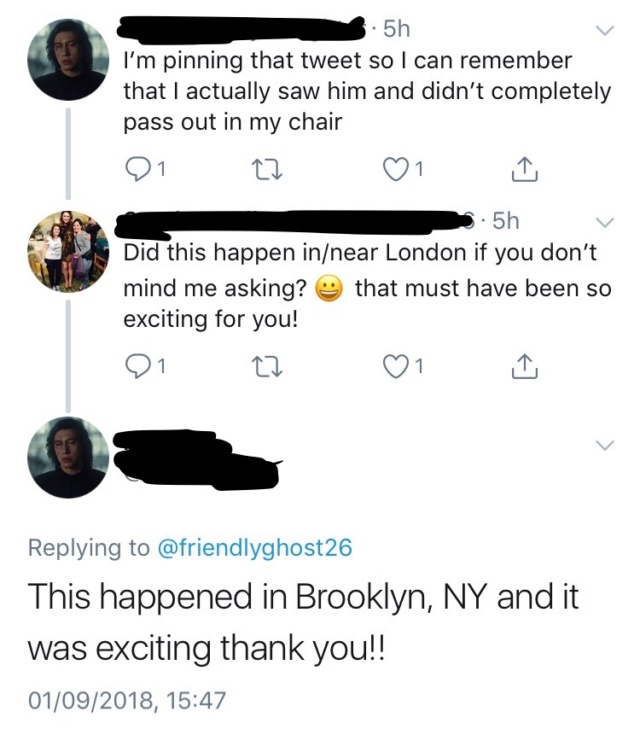 So he's not in the UK currently, or he could have just flown there for the weekend to spend time with his family. 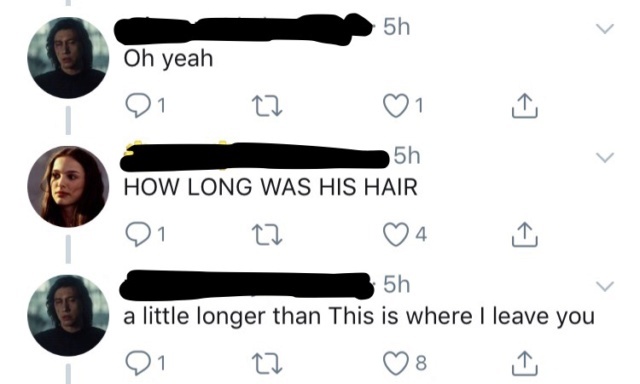 Hair watch update too! Dominic Monaghan was filming yesterday, so not sure if this means they won't share scenes or if he's not part of the FO or whatever. Thanks for this- great find . This doesn’t surprise me as the cast will have breaks in between so obviously he wants to go back home when he can . 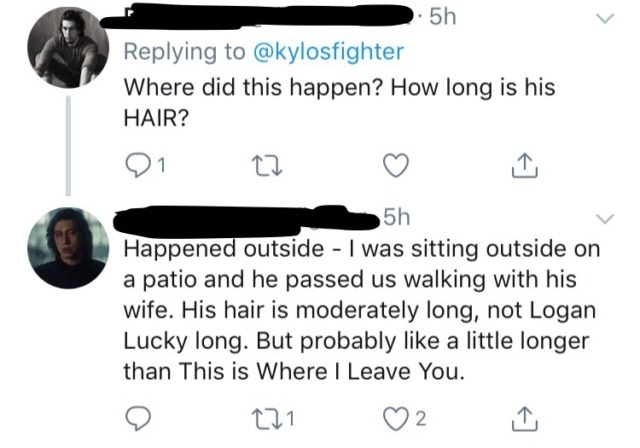 Interesting about hair length - bit longer than this is where I leave you - that’s his “ ah you do length “ presumably in TLJ which was also the length he had in the Snow White scene where Rey looked up at him from her glass coffin/ escape pod and he looked like a prince . There’s still 6 mths to go till Feb so plenty of filming yet for Adam am sure . Also didn’t someone say ( think it was here )that JJ Likes to film in scene order ? I don’t think We can rule out Dominic Monaghan being first order at this stage . We were at the Timothy Zahn panel at Dragon Con a few hours ago, and he said that JJ is going to be referencing something from the era of the Thrawn books in IX, and that’s what has some of his future book proposals on hold. We know that Batuu is going to show up in IX...but with his wording, this sounded like something else. @ISeeAnIsland wrote: We were at the Timothy Zahn panel at Dragon Con a few hours ago, and he said that JJ is going to be referencing something from the era of the Thrawn books in IX, and that’s what has some of his future book proposals on hold. We know that Batuu is going to show up in IX...but with his wording, this sounded like something else. @AhsokaTano maybe referencing the Grysks? Or hyperdrive navigation using the force? The emperor seeking to become a god-type being using the Unknown Regions? I read somewhere (Entertainment Weekly, maybe - something like that) that is his preference, yet with so much importance with IX for Disney & LF, and actor's schedules, etc, I would not be surprised if he is filming out of order for IX. He has to push his filming comfort zone with this one. Oooh exciting stuff! Thrawn era stuff appearing in episode 9!!! Grysks!!! !Or any of the other suggestions you’ve mentioned like hyperdrive navigation using the force ie original skywalkers using these to travel like the wolves in Rebels . 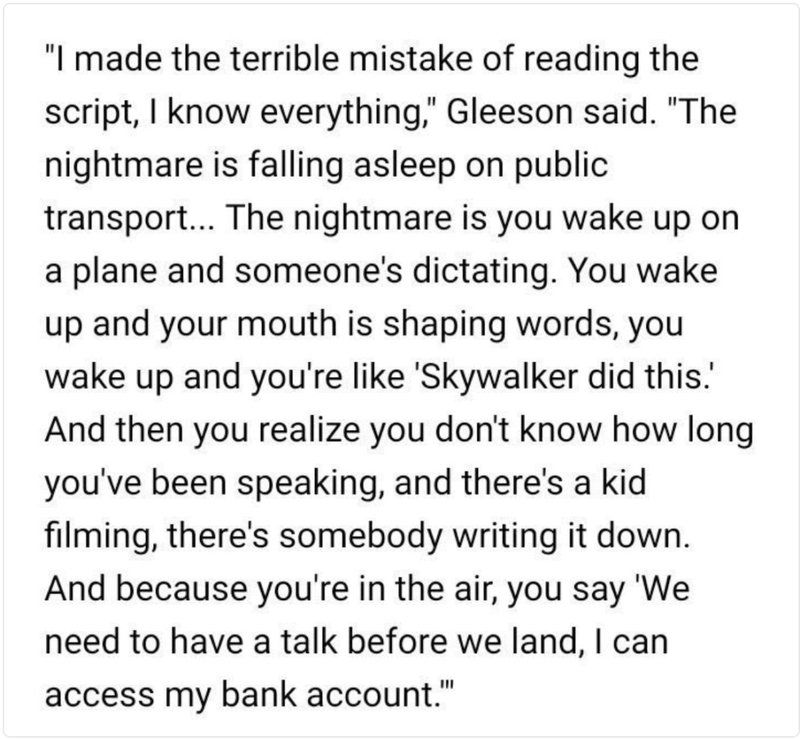 What was the phrasing used about skywalkers that Domhnall Gleeson used in his recent interview? Am super intrigued now . 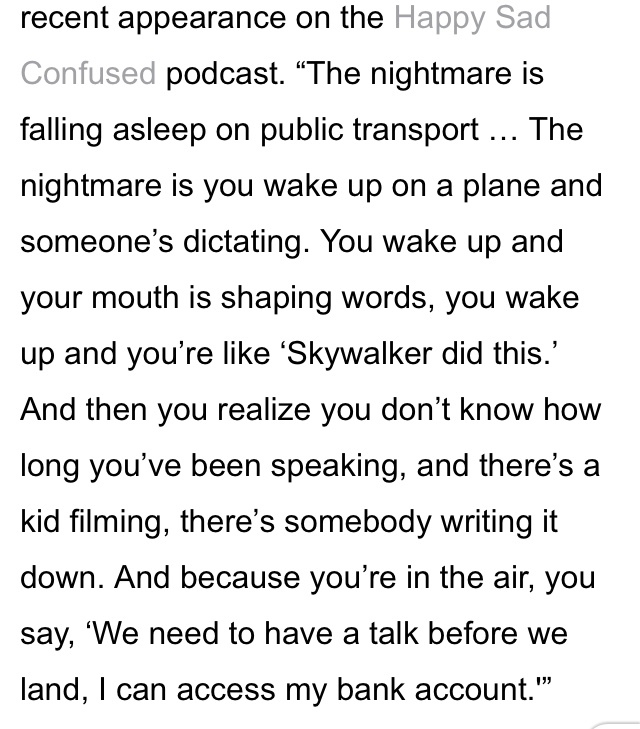 Interesting - he’s talking about how he’s read episode 9 script and worried about giving anything away and then says “ skywalker did that “ - so why say that and which skywalker is he referring to? Or does he mean skywalkers in general after what Timothy Zahn references in his books?It could be nothing or it could be a clue .... lol! I think he means Luke. They don't really refer to Ben SOLO as a Skywalker.... at least in my experience. @Dar-ren19 wrote: I think he means Luke. They don't really refer to Ben SOLO as a Skywalker.... at least in my experience. Or, it could be about Shmi? guys - I don't think we should take Domnhall's comment about "Skywalker did this" too literally like that's actually something Hux will say in IX. He is a sneaky little tease imo. 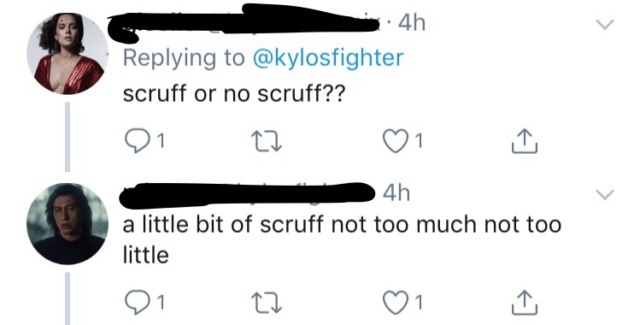 Let's pretend that's something he will actually say: my guess it's referring to something like changing Kylo's mindset. But like I said- I doubt that's in the movie. I've just finished the Aftermath trilogy and it sounds like I am starting on thrawn alliances just in time - I'm looking forward to discovering grysks! I don't take DG's example statement about Skywalker to mean anything - if anything it's a safe example to go with and not accidentally give anything away. I can't imagine the pressure these actors face! To me this implies his character has a lot of screen time - because a lesser character would not be reading the full script they'd only be reading their scenes. Then again, maybe DG says this because he knows his part of the movie, his scenes are the scenes that are central to the overall story. Both possibilities indicate Hux is going to be central to IX, and not just a wimpy rival wannabee to fully evil Kylo! It’s a joke Daisy made about getting her wisdom teeth pulled, what if she tells everything while under anesthesia? Oscar talks about Poe’s sexual orientation here, says Poe is open to any kind of “adventure”. “We asked Isaac, who’s been supportive of Poe’s possible LGBTQ identity, about his character’s ring and the use of the term “partner” in the guidebook. @Riri wrote: Oscar talks about Poe’s sexual orientation here, says Poe is open to any kind of “adventure”. It calls me on and on, across the universe"
Methinks this bodes very well for us- yaay!!! Snap Wexley's back. Surprising no one, since Grunberg is in most of JJ's stuff. Didn't exactly have the most screentime in TFA. I honestly forgot about him and that he even had a name until I got deeper into fandom! In addition Jai Guru Deva is usually translated as Victory to God /Divine - wonderful hint as well about balance with the Force...by extension, ultimate peace/balance for Anakin and Padme. 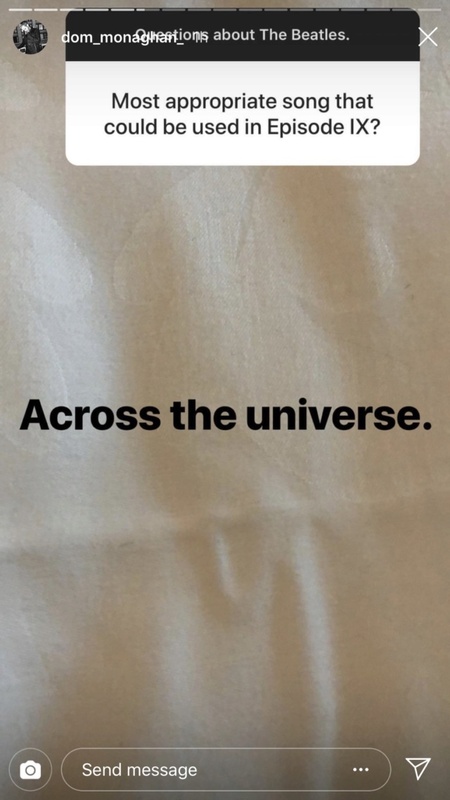 I wonder too if this hints at a scene/scenes that will be a feast for the eyes! Wonderful effects! Epic Nature! I admit hoping for that!